As UK-based Syrian organisations we wish to express our concern about the emergence of a new group, ‘The European Centre for the Study of Extremism, Cambridge’, which appears to exist primarily to spread propaganda for the Assad dictatorship. The organisation’s founder, Makram Khoury-Machool, is a close friend of Assad’s former ambassador to the UK, Sami Khiyami. Khoury-Machool is a former lecturer at the University of Cambridge and has a profile on Churchill College’s website. He appears keen to use the group’s presence in Cambridge and its connections to members of the University to promote it as a legitimate entity. Ali Haidar, a minister of the Assad dictatorship. He is the Syrian general secretary of the Syrian Social Nationalist Party, a group which runs a militia with between 6,000 and 8,000 members currently fighting on behalf of the war criminal Assad. Bishr Riyad Yaziji, the Syrian minister for tourism. He is most famous for being responsible for the disgusting advertising campaign which promoted Syria as a land of pleasure and plenty at a time when around one million people were suffering under starvation sieges (the vast majority of which were imposed, and continue to be imposed, by the Assad regime and its terrorist ally, Hezbollah). Hamid Baeidinejad, the Iranian Ambassador to the UK. The Iranian regime is responsible for war crimes committed in Syria, most recently during the brutal assault on Aleppo in which Iranian troops played a major role. 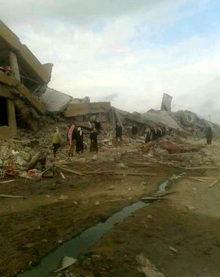 Syrian organisations in the UK have today written to the Prime Minister calling for the UK to investigate reports of Coalition responsibility for civilian deaths in al Badiya, and to review the priority the Coalition is giving to civilian protection. We were writing this letter about recent incidents in Syria when the shocking events at Westminster occurred, and we wanted before anything else to share the sense of grief and outrage felt across the community. Without diminishing the tragedy of this event, especially for its victims, it also acts to strengthen our parallel concern for the loss of life arising from certain actions in Syria for which we feel the British government shares some responsibility. There are now credible reports of a Coalition airstrike on the al Badiya school, west of Raqqa, a shelter for many refugee families, with probably at least 50 civilians killed (mainly women and children) with many sources estimating significantly more. This seems to be part of an emerging pattern of conspicuous disregard for civilian casualties in the current military campaign against ISIS. It includes the attack on the al Jina mosque last week that killed at least 50 civilians, and such incidents seem to be growing. The monitoring group Airwars estimates at least 2,700 innocent men, women and children have been killed in the Coalition’s anti-ISIS bombing campaign thus far. We are writing to ask the British government to immediately investigate the responsibility for al Badiya, and for similar attacks, to make known its findings and, more broadly, to review the priority the Coalition is giving to civilian protection. While many of these attacks are conducted by US forces, the UK is a major partner in the Coalition, with a British officer as deputy commander, and therefore carries joint responsibility for such actions. Moreover, we note that the Ministry of Defense has acknowledged that the RAF is conducting bombing operations in the Raqqa area. We share the all-important aim of ridding Syria of the barbaric ISIS regime along with supporting the democratic opposition to the no less brutal Assad regime. But, unlike such regimes, we must not be indifferent to civilian lives and suffering; those who have lived under ISIS have suffered enough. We urge the government to demand from the US the halt of the unacceptable loss of civilian life, which is in danger of becoming a distinguishing mark of this campaign. Top photo via Raqqa Is Being Slaughtered Silently. 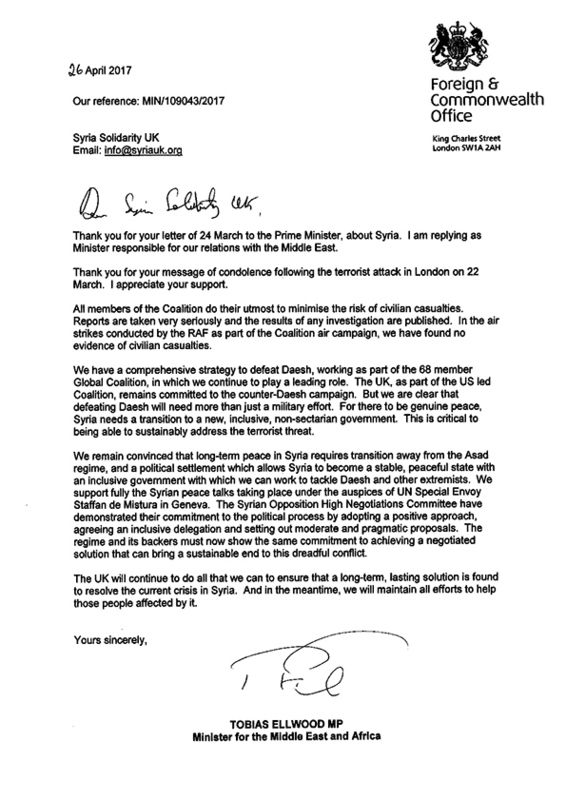 Thank you for your letter of 24 March to the Prime Minister, about Syria. I am replying as Minister responsible for our relations with the Middle East. Thank you for your message of condolence following the terrorist attack in London on 22 March. I appreciate your support. All members of the Coalition do their utmost to minimise the risk of civilian casualties. Reports are taken very seriously and the results of any investigation are published. In the air strikes conducted by the RAF as part of the Coalition air campaign, we have found no evidence of civilian casualties. We have a comprehensive strategy to defeat Daesh, working as part of the 68 member Global Coalition, in which we continue to play a leading role. The UK, as part of the US led Coalition, remains committed to the counter-Daesh campaign. But we are clear that defeating Daesh will need more than just a military effort. For there to be a genuine peace, Syria needs a transition to a new, inclusive, non-sectarian government. This is critical to being able to sustainably address the terrorist threat. We remain convinced that long-term peace in Syria requires transition away from the Asad regime, and a political settlement which allows Syria to become a stable, peaceful state with an inclusive government with which we can work to tackle Daesh and other extremists. We support fully the Syrian peace talks taking place under the auspices of UN Special Envoy Staffan de Mistura in Geneva. The Syrian High Negotiations Committee have demonstrated their commitment tothe political process by adopting a positive approach, agreeing an inclusive delegation and setting out moderate and pragmatic proposals. The regime and its backers must now show the same commitment to achieving a negotiated solution that can bring a sustainable end to this dreadful conflict. The UK will continue to do all that we can to ensure that a long-term, lasting solution is found to resolve the current crisis in Syria. And in the meantime, we will maintain all efforts to help those people affected by it. Six years ago, thousands of Syrians took to the streets to protest the brutal Assad regime. The Assad family had kept power for four decades through repression, imprisonment, torture, and mass killing. The people who protested knew what they were up against, remembering how the regime had slaughtered tens of thousands in Hama in 1982. In 2011 the regime even tortured children who dared write anti-regime graffiti on a wall in Daraa. People knew, and still they took their lives in their hands, marching, singing, dancing in the streets. Videos of those first protests look incredible now, the buildings intact, the streets filled with humanity. Today’s images are the reverse. Humanity driven out. Cities, towns, homes crushed. The slogan of regime thugs was ‘Assad or we burn the country.’ They have. In the past, the regime had sponsored terrorism to destabilise neighbouring countries. From 2011 it turned the same strategy against the opposition. Peaceful protesters were jailed while jihadist veterans of the Assad-sponsored terror campaign in Iraq were released, and pro regime ‘Shabiha’ gangs carried out sectarian massacres to deliberately drive communities apart. Al Qaeda in Iraq had been a longtime client of Assad’s. In 2013-2014, it rebranded as ISIS and moved against the Syrian opposition, aided by Assad’s air force which targeted the opposition but not ISIS. The scale of Bashar al-Assad’s brutality outstripped that of his father, bombing and shelling city after city, killing hundreds of civilians with nerve agent and chlorine. But this was not enough to defeat the revolution. To survive, Assad invited in Hezbollah, then Iranian military forces, sectarian militia from Iraq, and even Afghans recruited by Iran. By 2015 Assad teetered on the edge of collapse. It took direct intervention by Putin to keep Assad in place. Russia’s air force bombed not only the armed opposition but systematically targeted hospitals, schools, bakeries, water facilities. Now in 2017 Assad is in hock to Shabiha warlords, to Iran, and to Russia. He rules from a position of weakness over a patchwork of competing interests that between them control the biggest population centres, but only a minority of the territory of Syria. Opposition-held territory is still under daily attack, despite a ceasefire announced by Russia and Turkey in December. In regime-controlled territory detentions continue, and thousands upon thousands remain hidden in Assad’s torture prisons. For Syrians who have fled, return to either bombing or torture is not an option. The UK Government has never backed any serious proposal to protect civilians in Syria. Even the abortive proposal for action after the Ghouta chemical massacre focused not on protecting civilians but on punishing the use of just one category of weapon. Calls for a no-fly zone or no-bomb zone were locked by Western leaders who didn’t want any responsibility for what would come after. In the name of ‘stability’ the regime was given license to murder. When the House of Commons voted against action in 2013, too many people here saw that as the end of the story and turned away. Then the number of Syrian refugees registered in the region was 1.84 million. Today it is close to five million. The various counts of numbers killed outstrip the capacity of our imagination. Half a million or more people are estimated killed, but the fracturing of control makes a reliable total impossible. The Syrian Network for Human Rights has counted a minimum of 206,932 confirmed violent civilian deaths. 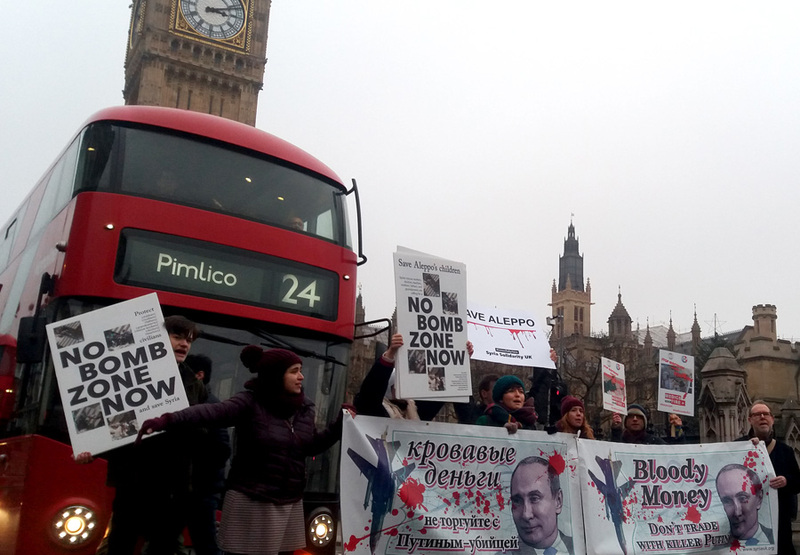 Throughout 2016, Syria Solidarity UK and others campaigned for humanitarian air drops to besieged civilians. Behind the scenes at least some in the Foreign Office and elsewhere tried to make this happen. Serious proposals were developed to use existing drone technology at relatively low cost and at no risk to UK personnel, but these ideas were blocked. It seems the Ministry of Defence is more interested in spending money on developing new drones to kill rather than on drones to save lives. In 2017, UK diplomats are still saying the right things, still supporting the Syrian opposition in negotiations that are supposed to lead to inclusive representative legitimate government. And DFID continues to provide humanitarian support in the region to victims of the war. But in Syria now it is military action that determines political and humanitarian outcomes. Current negotiations seem even more of a sideshow than previous efforts, and the UK’s humanitarian effort continues to be a costly attempt to contain the damage while doing nothing to bring it to an end. While the Foreign Office and DFID present the best face of UK policy, the Ministry of Defence falls in line with a US policy that targets only ISIS and seems happy to hand territory over to Assad, Hezbollah, and Russia, with no regard for the consequences. Unless there is now a serious plan to achieve legitimate inclusive government in areas liberated from ISIS, unless the Assad regime is prevented from regaining more territory, unless there is a serious plan to protect civilians, the result will be to entrench the misery of the refugee crisis and to strengthen extremism. This year we must not turn away. The truth about the White Helmets. Last week Syria was centre stage, not on the news channels for once, but at Hollywood’s biggest event of the year. The Oscar for best short documentary was awarded to The White Helmets, a film showing the heroism of Syria’s volunteer rescuers. The film’s director Orlando von Einsiedel read out a message from Raed Saleh, head of Syria Civil Defence: Their work, he said, is guided by the verse in the Qur’an ‘To save one life is to save all of humanity,’ and he called for peace in Syria. Celebrities rose to their feet in recognition of his call. In response, Russia’s Embassy to the UK posted this cartoon on their Twitter account. At first I thought it must be a hoax—the real Russian Embassy tweeting this image? The creator of this image Iad Tawil (who describes himself as ‘a secular Syrian’) has playing into the most pernicious stereotypes of his fellow countrymen. Using nakedly racist imagery, the cartoon depicts a thick lipped man, shaggy beard trailing down his chest, a suicide vest beneath an camouflage shirt. On his head is a white helmet, in his hand a shiny Oscar statuette shrinks away from him. Who would want to attack the White Helmets? To date they have saved over 82,000 lives. Formed as self organised groups of volunteer rescuers in late 2012 in areas that were independent of the regime, these volunteer first responders joined together as Syrian Civil Defence in 2014. Numbering 3,000 people, they are ordinary men (and some 70 women) who risk their lives to help others. These are the people that run towards the burning buildings, the ones lifting rubble with their hands to reach buried children, who they are sometimes able to rescue alive. Yet people do attack them. The best way to understand this might be to ask who is doing the attacks? And what’s in it for them? The cartoon is just the tip of the iceberg of the vast quantity of propaganda directed against Syria Civil Defence rescuers. On the night of the Oscars, the first media outlet to post in any depth about the award was Russia Today—or ‘RT’ as they have been rebranded—an outlet funded by the Russian state. They had obviously prepared. The headline? 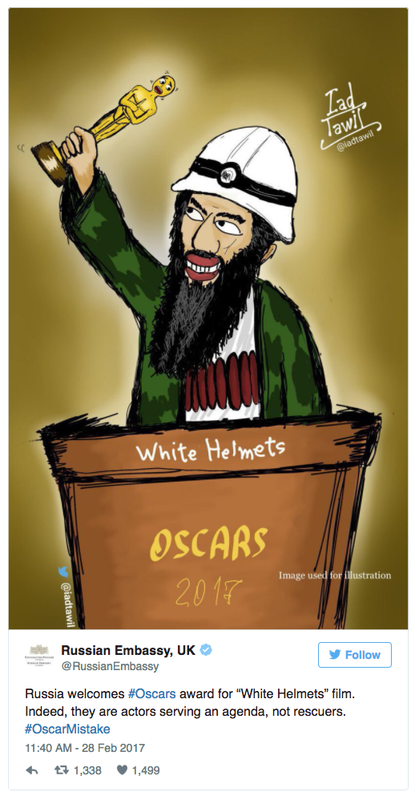 ‘Film about Syrian White Helmets Wins Oscar Amid Allegations of Terrorist Ties’. These allegations come from Russia and from the Syrian Regime. The term post-truth is used to imply that the truth does not exist, but the truth is still there, it’s just that people are less confident about where to find it, and the trolls are ready to exploit this. Using images and strategies straight out of the propagandists handbook, they repeat lies until they acquire a veneer of truth. One of the favourite smears of the many propaganda sites and Russian paid trolls is the accusation that the White Helmets are connected to Al Qaeda. They cite their presence in areas in which the Al Qaeda linked Al Nusra Front is present to imply this connection. The White Helmets operate with a policy of neutrality (which has included rescuing regime soldiers) and consequently work in areas controlled by many different groups. The second favourite smear is that they are Western dupes—by receiving financial support from the US, UK and others they are unwitting pawns in the Western imperialist war. What is most striking is that the accusation itself shows a Western imperialist and racist attitude, unable to imagine that Syrians might think and act for themselves. While the UK should be ashamed of its failure to act against the Assad regime’s killing of civilians, giving practical support to the support the courageous work of the White Helmets (such as equipment donated by London Fire Brigade) is something to be proud of. So we get to the why. Both these smears play to the advantage of the Assad regime and Russia. The White Helmets are a threat to them. By showing humanity and bravery, the White Helmets prove daily that there is a better alternative to the Assad regime’s savagery. The White Helmets have a media unit to communicate and record their work and through recording their work, people also see the abuses—bombing, chemical weapon use, phosphorus, that have been perpetrated by the Assad regime and Russia upon Syrian people. In the simplest terms, the White Helmets are also a practical obstacle. They are trying to save the very lives that the Assad regime is trying to control and extinguish, and so the regime treats them as a target. 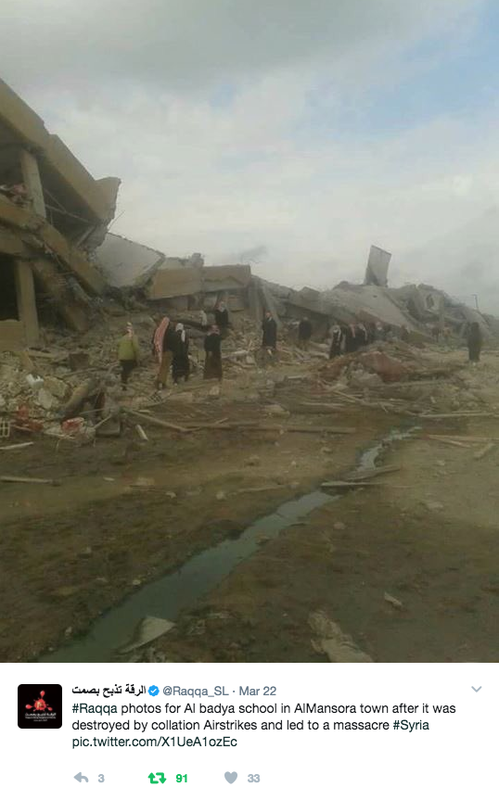 On the same day the Oscar was awarded another Syria Civil Defence centre was hit by aerial bombardment in Idlib. To date 154 volunteers have died in their work. Syria Civil Defence rescuers are also vulnerable to persecution by the regime. In the evacuation of Aleppo, White Helmets volunteer Abdulhadi Kamel was abducted by pro regime forces, and a forced confession was broadcast. Amnesty International and the White Helmets are campaigning for his release. We talk of post truth but ultimately the truth must be heard. This is precisely why the documentary, and the award of the Oscar was such a threat to the regime and Russia. Watch the film, follow the White Helmets, and tell people you know about their heroism and about the need for peace in Syria, because that’s what the propaganda cannot be allowed to hide.